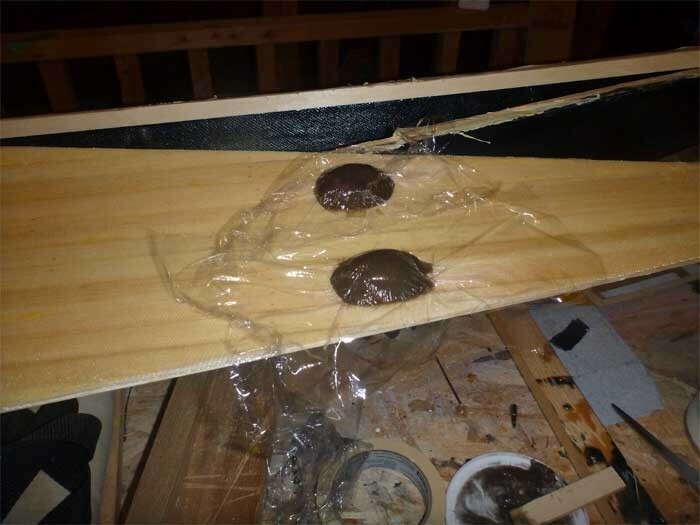 "Petrus i Tranås gör på liknande sätt: packar in slangen i förtjockad epoxy (microfiber, slipdamm eller liknande) och avslutar med ett lager väv i epoxy." Bortset fra det blev det klaret i en arbejdsgang, med lidt efterslibning. Og det er tæt. @Petrus: You do it a little differently then I do. For reinforcement I rely mostly on the chopped fiberglass. The outer layer of glass smooths the resulting fitting. On my next commercial build I'm going to try something even more different: I'm going to laminate the tubes using woven carbon biaxial sleeving. They should be even lighter and stronger. The Bondo is waterproof, so that should not be a concern. It also fills in like an epoxy so there should not be an leakage. I think the use of the thick walled windshield washer tubing /wire/teflon tape combo is probably more intriguing than the use of the Bondo. I was amazed at how well the tubing/wire held the tight radius without collapsing. The teflon tape made the removal very easy. Sorry for second posting but I just found an interesting article on the West System's website. Assuming that a polyester gel coat is similar in properties to a polyester filler (like Bondo Hair), I should be safe. According to the article "Applying gelcoat to a cured laminate relies on a mechanical bond. Because of the difference in curing chemistry, it is not possible to achieve a chemical bond between epoxy and polyester gelcoat. We developed some tests, to determine whether or not the mechanical bonds achieved between gelcoat and properly prepared, cured epoxy were strong enough to achieve a durable repair." In a nutshell, the test concluded that the mechanical bond between the poly gelcoat and the epoxy was quite acceptable - even in below waterline applications. That polyester gelcoat will bond to a properly prepared WEST SYSTEM® epoxy as well as to a cured polyester laminate. That polyester gelcoats can be applied over cured WEST SYSTEM epoxy on repairs below the waterline. So, I guess the concern with poly over epoxy is based on the fact that there is no chemical bond but rather it must rely entirely on mechanical. Given the rigour of the tests by West Systems, I think it's OK to use the poly filler with the fittings. Once caveat - I am not a chemist, so I can't attest to whether the poly gel coat is the same as the poly filler. I'm just thinking that they are basically the same chemcial composition. I wouldn't lose any sleep over adhesion in this case.